PRODUCT: Chemcurb 7-1/2" I.d. Round Kit. Contains 2 Pair (4 pieces Total), 7-1/2" Round Curbs, 1-gallon Black Color 2-part Pro-Pack Pourable Urethane Filler, Two 10.3 Oz. Tubes Of M-1 Sealant. Price/Kit. APPLICATION: ChemCurb creates a tough, 2-inch deep poured rubber seal. A curb is bonded to the roof surface (EPDM, PVC, BUR, coal tar, SBS mod bit, granulated APP, many types of coated metal, metal flashing details and FRP), creating a form for the rubber seal and protecting it from ice or mechanical damage. M-1™, the bonding adhesive included in the ChemCurb System, is a tough, thermosetting adhesive capable of bonding steel deck to bar joists and metal sandwich panels to roof and wall purlins. M-1 develops 300 lbs. per square inch of shear strength on metal, masonry and wood. It is capable of 300% elongation and can accommodate dimensional changes in construction materials down to minus 20 degrees F, and is solvent free. Pro Pack™ is a black color two-part, urethane pourable sealant that is 100% solids. It requires mixing but delivers a much faster cure than 1-Part. 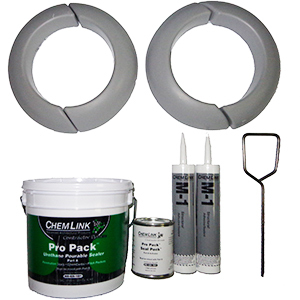 Pro Pack is self-leveling, non-shrinking and cures to a flexible, long-lasting urethane seal. Available in one-gallon buckets with hardener.